I’ve been cooking for one party after another recently and did a party for 60 people the other day. All the food went down well but the clear winners were my rolled crepes canapes – they always are. 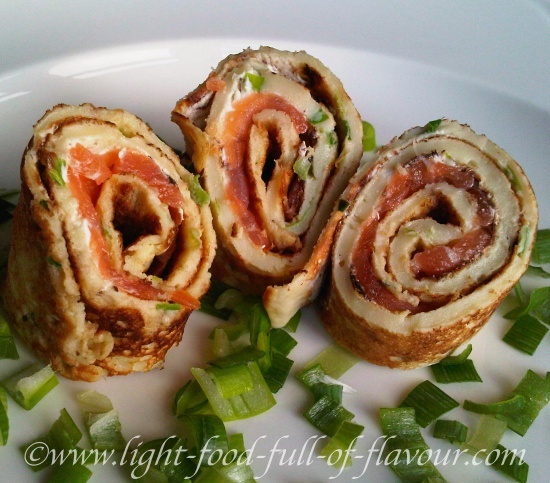 I make two types of rolled crepes – one with smoked salmon and one with smoked ham. The way you make crepes, very thin pancakes, is the way we make pancakes in Sweden. Compared to pancake recipes from most other countries, Swedish pancakes contain much more eggs and none more so than the sublime pancakes my mother used to make. I follow in her footsteps and use a lot of eggs when making pancakes, 3-4 eggs. And for these crepes that I use as savoury canapés, I add chopped spring onions (scallions) to the batter. 1. Crack the eggs into a bowl and add the flour, salt and 1/3 of the milk. 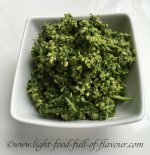 Whisk vigorously – best thing to use is an electric whisk – until you have a lump-free batter. Add the rest of the milk and whisk a bit more. Add the chopped spring onions (scallions) to the batter. Cover and leave to rest in the fridge for 30 minutes. 2. Melt 1 tablespoon butter in a large frying pan and add the melted butter to the pancake batter whilst whisking. You only need to use a small amount of butter, ¼ of a teaspoon, for frying each pancake. 3. The frying pan needs to be quite hot and the butter should be turning brown before adding a small ladle of pancake batter to the pan. Swirl the pan around to cover the entire base of the frying pan. Each pancake should be quite thin but not so thin that they fall apart. 4. Fry for about one minute, until you can see that it’s nicely browned (just lift up a corner), before carefully flipping the pancake over. Fry for another minute. Transfer to a plate. I place a piece of baking parchment between each pancake so that they don’t stick together. Leave the pancakes to cool down. For the fillings, mix together cream cheese and horseradish sauce for the salmon filling, and the cream cheese, horseradish sauce and mustard for the ham filling. Spread some of either filling across the lower part of one pancake and add slices of salmon or ham. Spread a little bit of the filling at the very top of the pancake and roll up the crepe tightly. Cut of untidy ends and alternating between diagonal and straight cuts, cut the rolled up crepe into about 5-6 slices (depending on how large you made your pancakes).